Before I became deeply affected by Romanesque architecture, I hardly knew anything about the subject. That only came with time. Hence I was slightly unpleasantly surprised when somebody, looking at my pictures of the church in Chissey-lès-Mâcon, said : "Ah, you managed to find the modillons as well!". I did not even have the foggiest what a modillon could haven been! Since that time I have learned a few things. 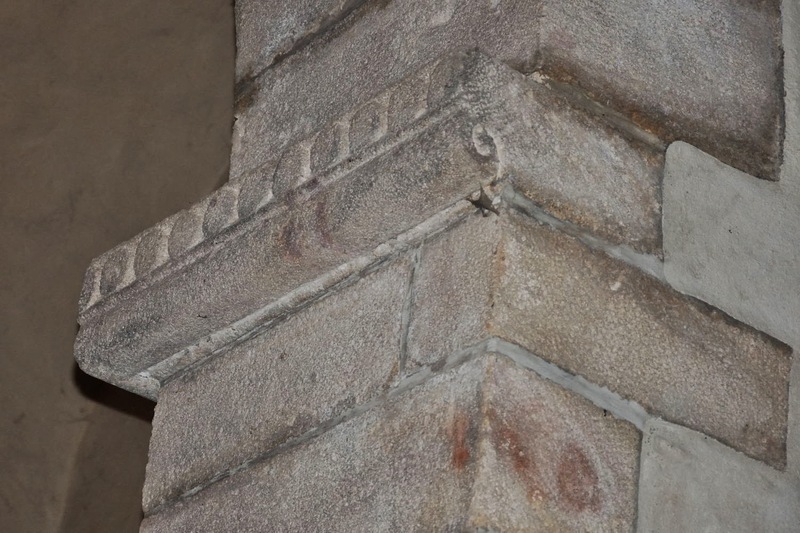 A modillon is a short corbel, supporting a roof edge or cornice. Whatever was so special about those corbels remained a mystery to me, until I realised that corbels decorated with a relief are not present on every church. I have experienced that the more you look for them, the more you find. And not only at roof levels where you can spot them with the naked eye; they can also be found at the roof edges of relatively high bell towers, where one can hardly distinguish them. It still happens from time to time, that whilst processing my pictures I blow up the top of a bell tower, indeed finding some interesting details which I had not spotted whilst taking the picture. And the more churches one investigates this way, the more one starts to appreciate the sometimes bizarre details one finds. By now I have an impressive collection of men sticking out their tongues, men hanging upside down, modillons with a double head, a cow's head, a dog's head, hands in all sizes and shapes, geometric patterns, etc. etc. This blog does not go into the deeper meaning behind those depictions. I am sure there is one, but I simply lack the knowledge to say something sensible about it. Despite this, I still like to go into the Brionnais, because many a church in that area has sufficient nice or funny or gruesome modillons to fill several films of 36 exposures. 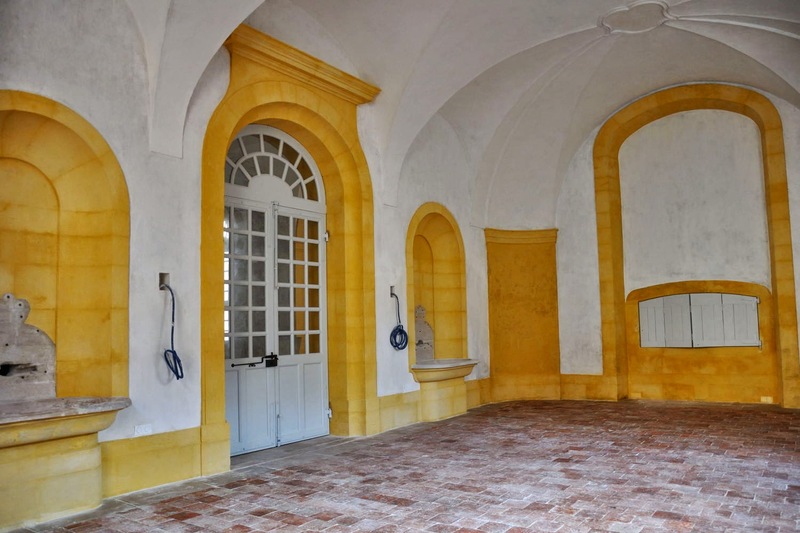 All pictures except one were taken in Châteauneuf; the only reason behind it is the fact that it was the first series (but certainly not the only one!) in my collection giving me more than sufficient photographs for this blog. 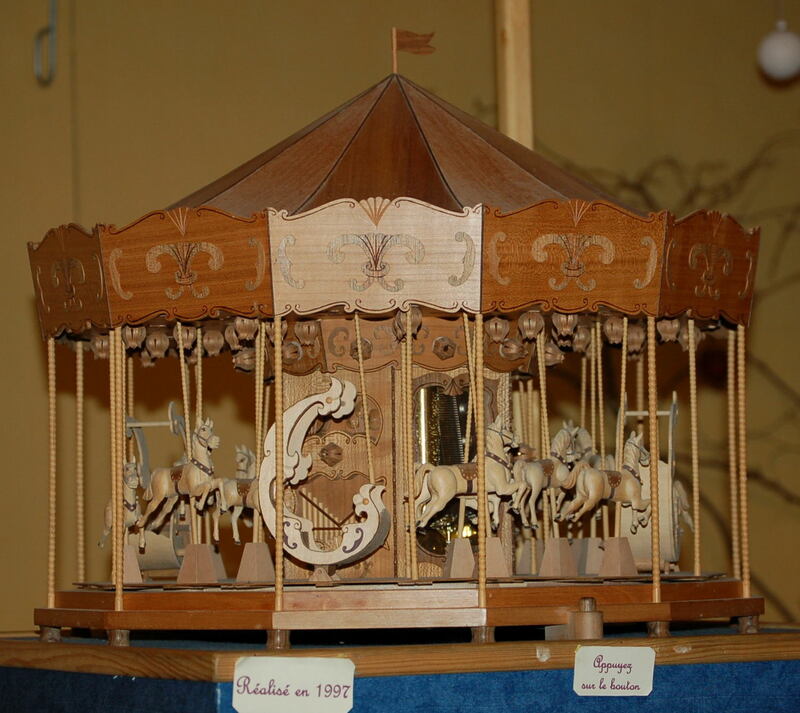 The Brionnais is less than an hour's drive from La Tuilerie de Chazelle. 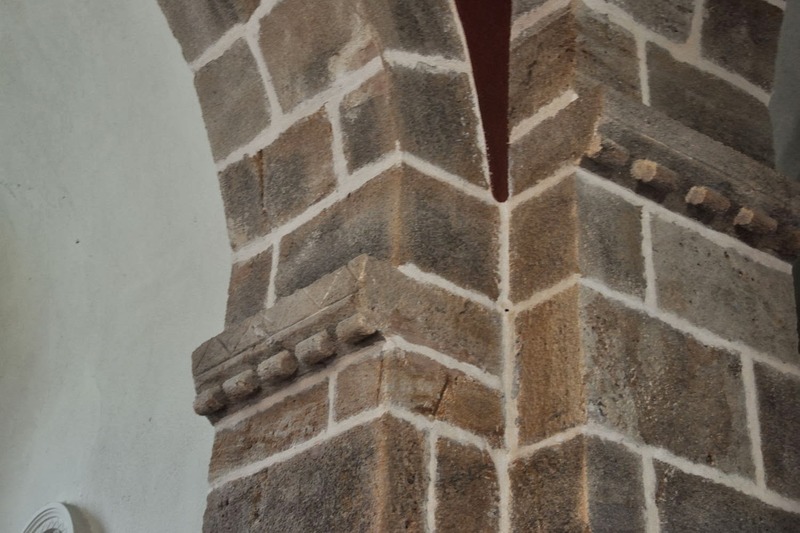 In many Romanesque churches one finds, between the end of a column or pilaster and the beginning of the arch an impost, a usually trapezoidal ridge protruding from the face of the column or pilaster. One could call an impost a decoration, albeit not a very exuberant one. 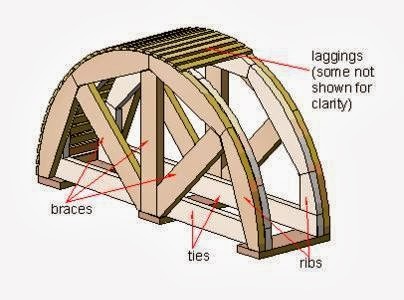 I think that it also served as a support for the centring, the wood construction carrying the stone arch as long as it is not finished and hence self-supporting. 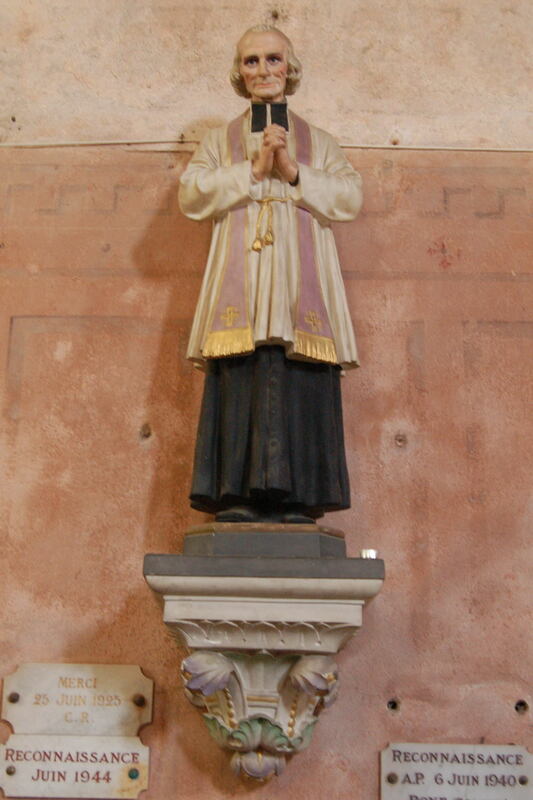 The first time I stumbled upon a decorated impost was in the Saint-Pierre in Brancion. Apart from the frescoes this is one of the very few decorations in the church. What exactly is shown in this relief is not very clear to me; to me it resembles a relief of two fighting dragons, battling head to head. 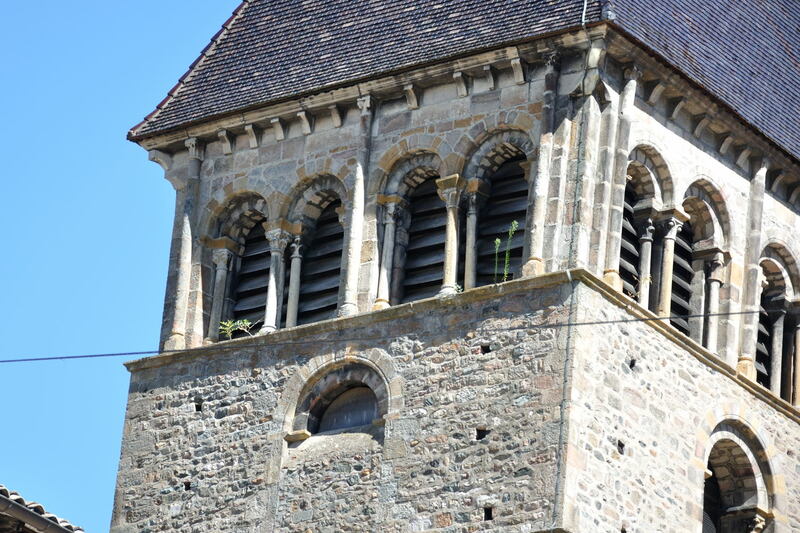 But I found also something interesting in the Notre-Dame-de-l'Assomption in Champlecy. This is clearly shown on the picture below. 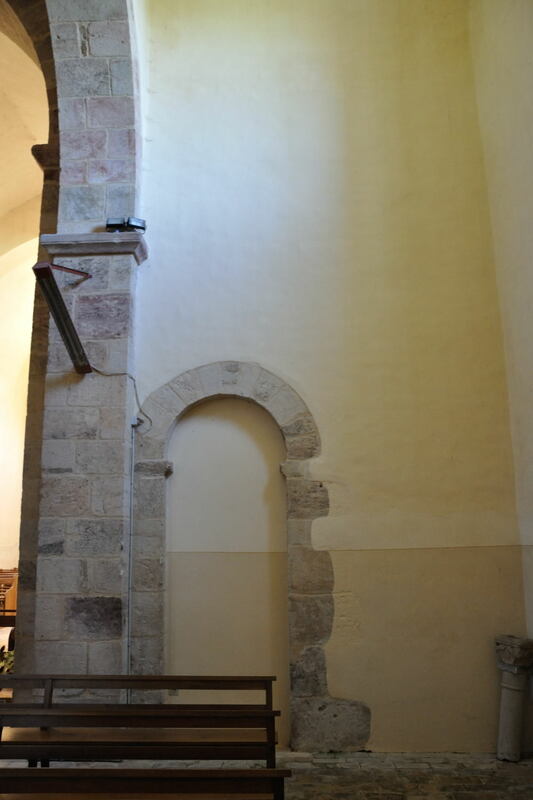 On the right hand side of the picture there is a "normal" impost, which you can find in almost every church. The left hand side one however, has been decorated with a sculptured cylinder attached to the slanting side of the trapezium. Something similar I encountered in the Saint-Nizier in Baron. 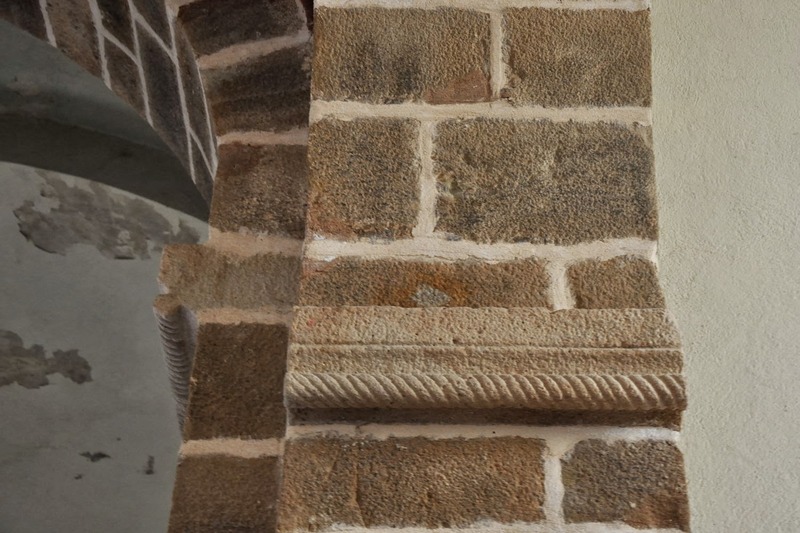 The first picture shows an impost as described above, but here the cylinder has been intrinsically decorated as well; the second one shows an impost decorated with a row of cylinders in a billette pattern. 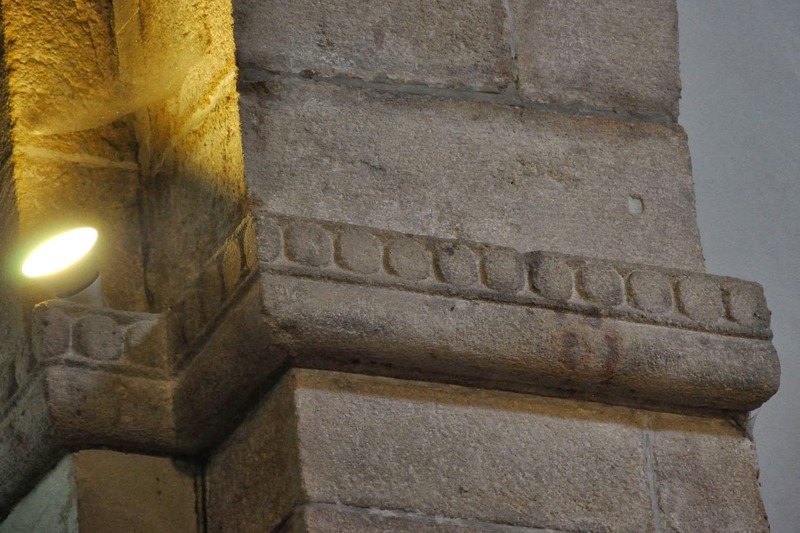 Finally, in the Saint-Pantaléon in Trambly I found an impost decorated with a pattern consisting of a row of circles, similar to a pattern with oves. On top of that the slanting side of the trapezium has been replaced by a rounded rectangle. Besides, (see 2nd picture) the face of the rectangle perpendicular to the longer side shows a curl, suggesting a stone "scroll". 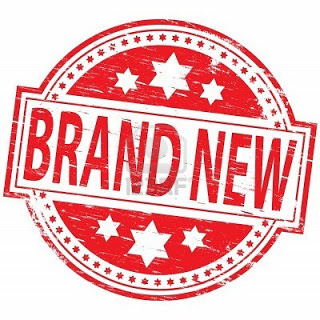 I had never imagined that something at first sight looking so relatively simple as an impost would lead to such an extensive blog! 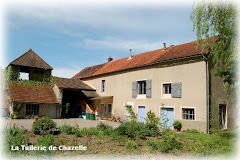 For the website of La Tuilerie de Chazelle, click here. I have kept myself busy for quite some time now composing an interactive map of (amongst others) Saône-et-Loire, which enables the user to easily spot where exactly to find Romanesque churches. 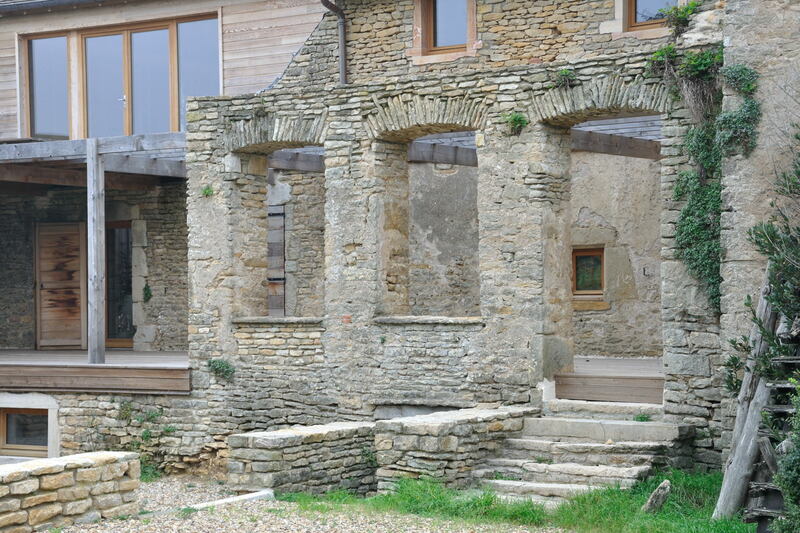 Basis for this job was the inventory of Romanesque churches in Burgundy to be found on "Le site sur l'Art Roman en Bourgogne". That sounds simpler then it is in reality. Firstly one starts off with a place name and preferably a postal code. 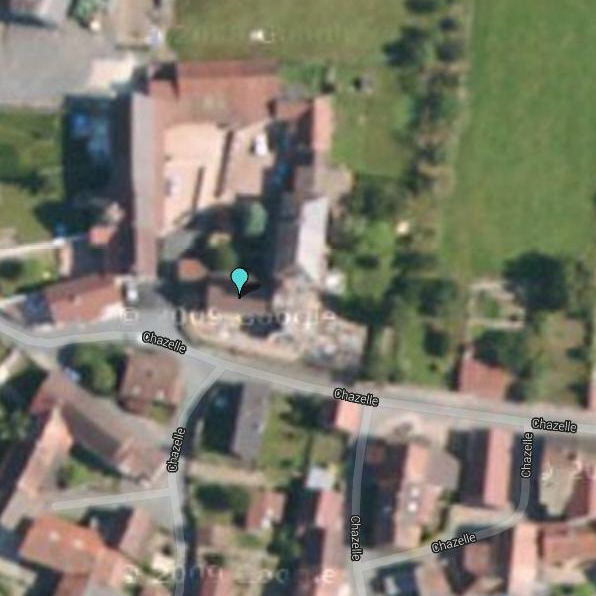 Those two pieces of information will locate at least the village or the town quite accurately in Google maps or in Geoportail, the French equivalent of Google Earth. For villages one has to start looking for a church on the satellite map. A church is often recognisable (but not always!) 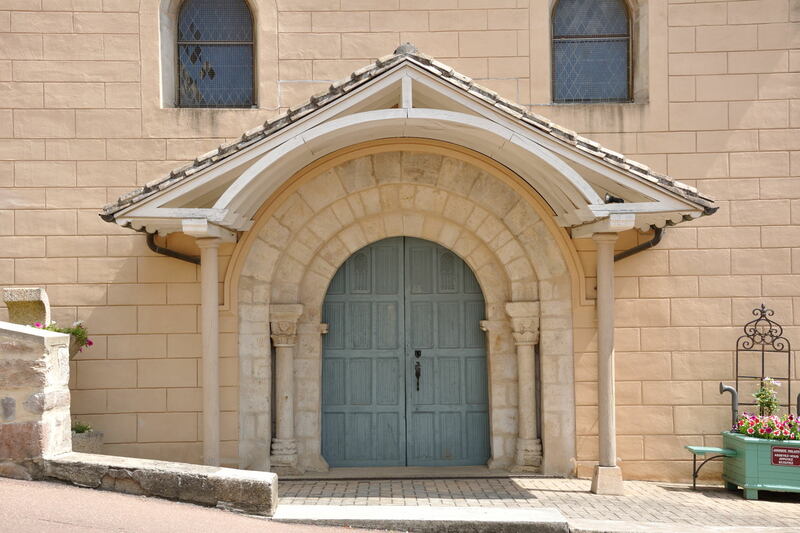 from its cross shaped plan, from the fact that a church is often (more or less) orientated along a west-east axis, and from the often semicircular chevet which closes off the body of the church on the east side. 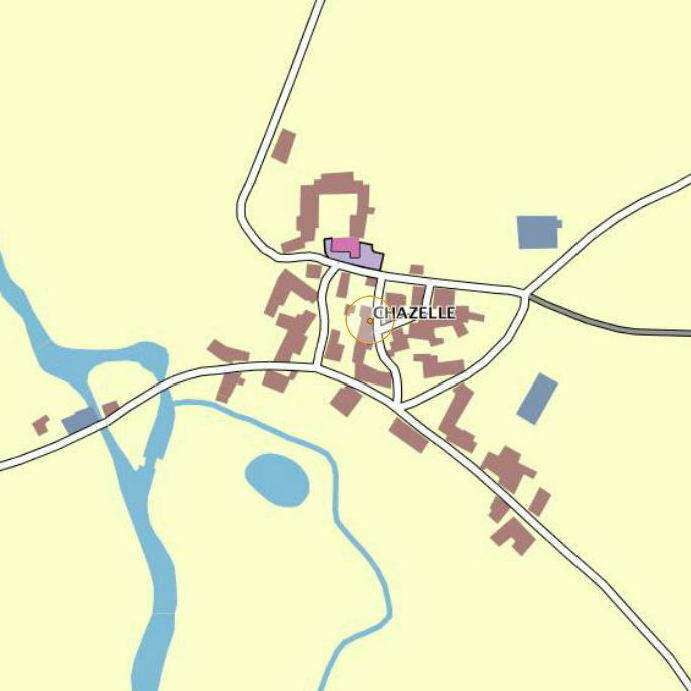 If the map gives street names, a street name contaning the word "église" is a give-away as well. An excellent example of such a church is the one in L'Abergement-de-Cuisery. Another give-away is that lots of churches are located on or next to a graveyard, like the church in Chapaize. 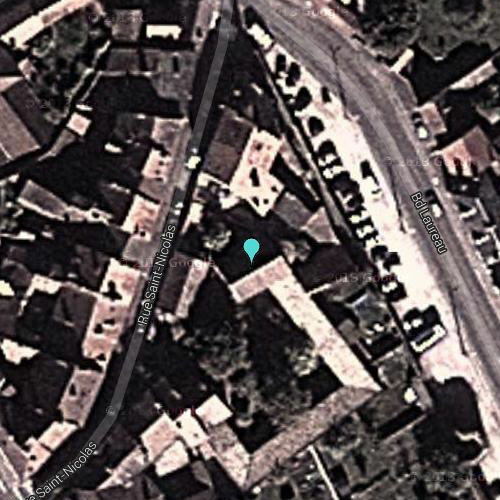 That not all churches are to be found so easily can be seen from the aerial picture of Autun Cathedral. The orientation is more north-south than west-east, it does not show a clear cross shaped plan and the semicircular chevet can hardly be recognised on the picture. 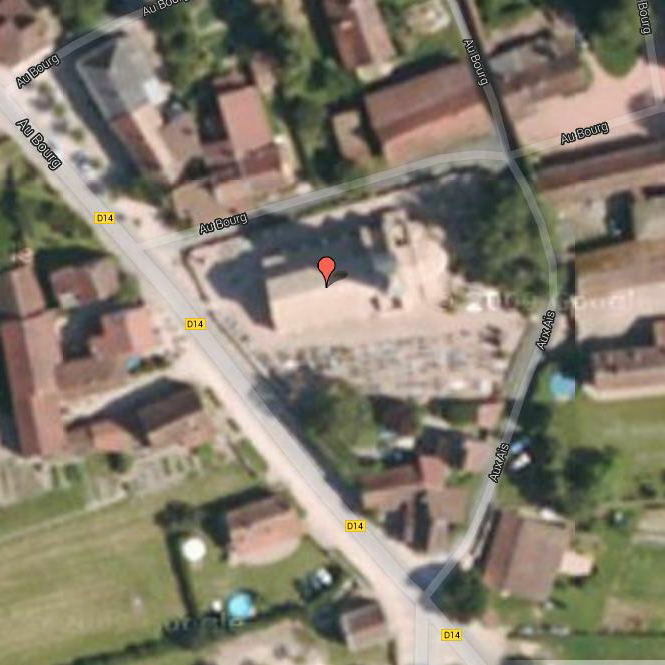 Fortunately Google maps locates the church for you when you enter "Autun Cathedral" in the search window. Another interesting example is the church in Trivy. This church is easily recognisable as a church, however, it is even more clearly north-south orientated than Autun Cathedral. The eastern arm of the cross has a semicircular ending. This church was once a "normal" church, and orientated west-east. 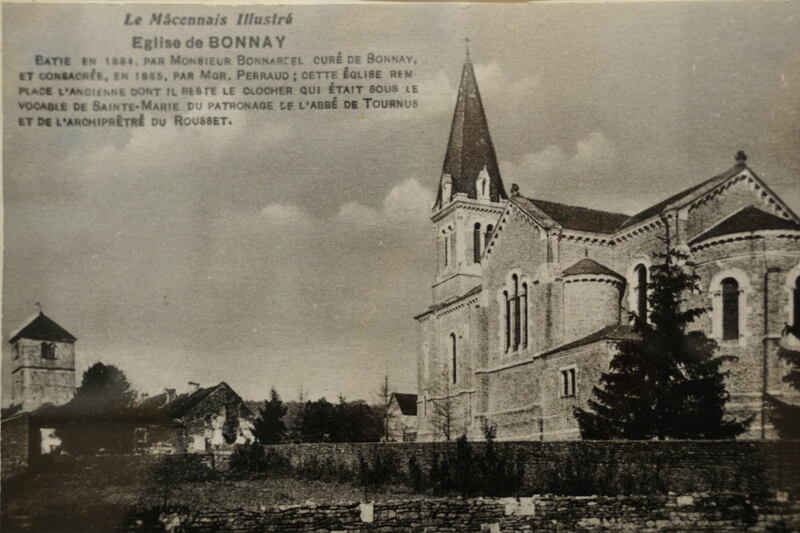 The present semicircular chapel was once the chevet of the church; when the church became too small the nave was demolished, and a new nave was built in north-south direction because there was more space available than in the "correct" direction. 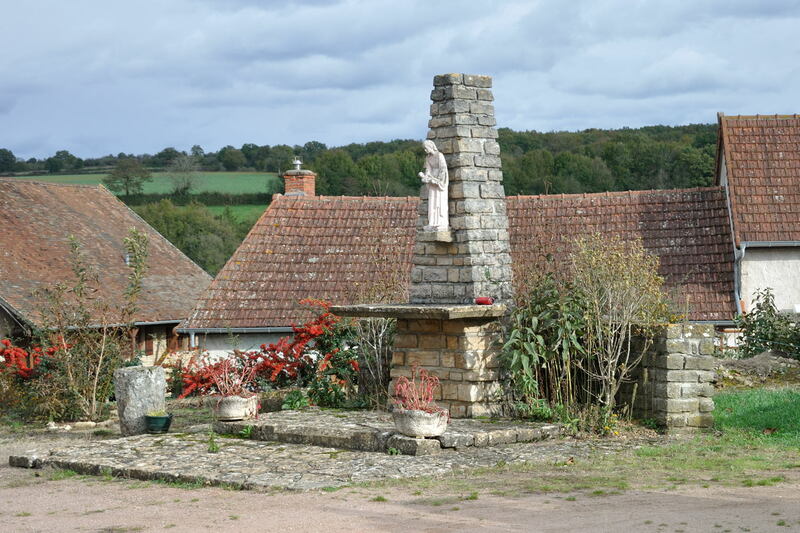 the old chevet hence became a side chapel. A chapel is often even more difficult to find. It is quite often rectangular, hence not having a semicircular chevet, and the orientation is sometimes random. 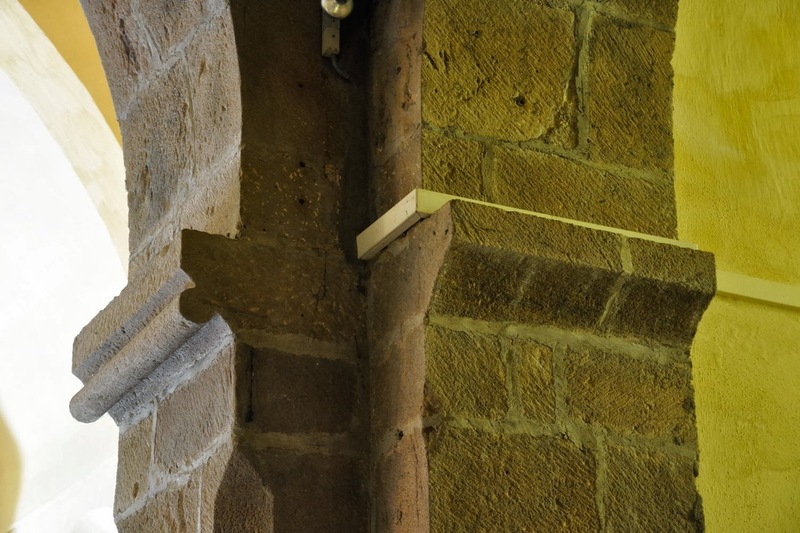 This is clearly the case with the Chapelle Saint-Nicolas in Autun. 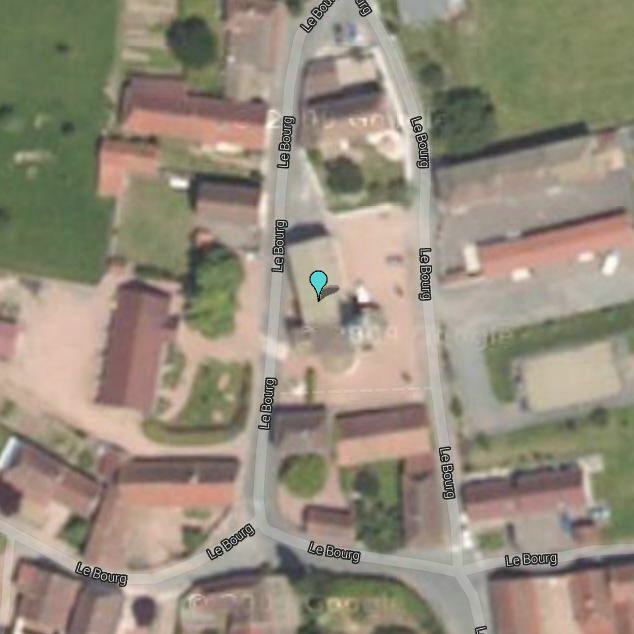 Again, searching in Google maps for a street name or for "Chapelle Saint-Nicolas", or asking somebody who has sufficient knowledge or literature will solve this problem. Ordinary road maps can also be of help. The Michelin road maps and the IGN walking maps indicate churches quite accurately, showing the researcher at least on which side of a road or of a village one can find the church. 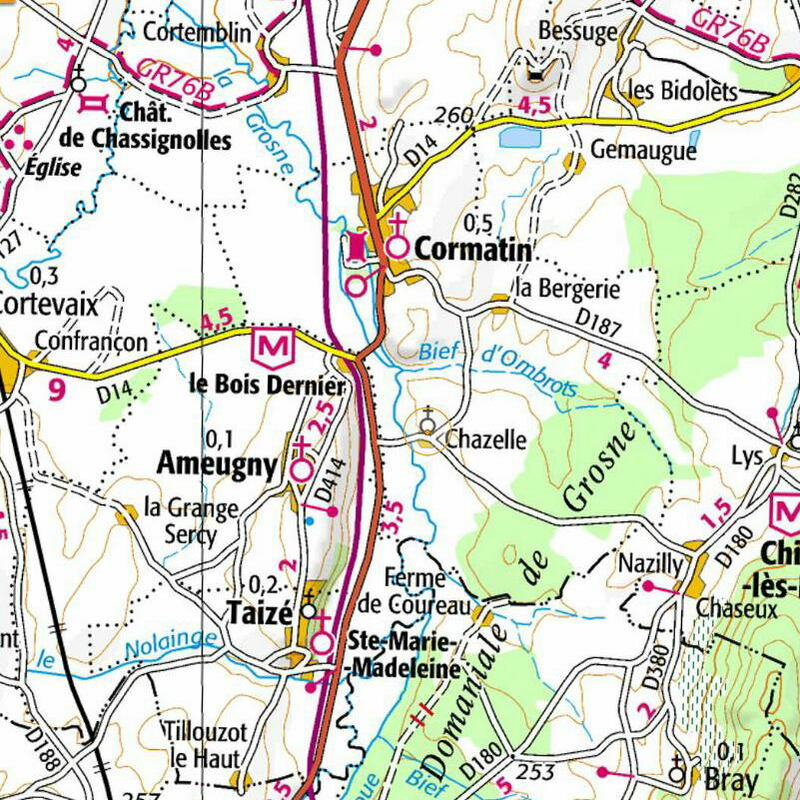 The aforementioned site Geopotail.fr offers even better options. When starting up this site it offers a satellite map; however, in the lefthand menu it offers a variety of maps to choose from. The first option is the IGN map. 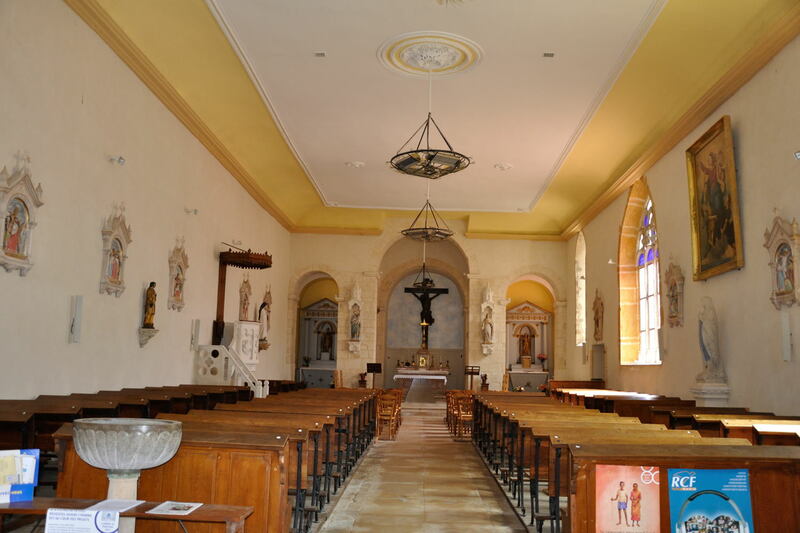 To illustrate the use of Geoportail I have chosen to look for the church of Chazelle, because I can find this church in real life with my eyes closed. 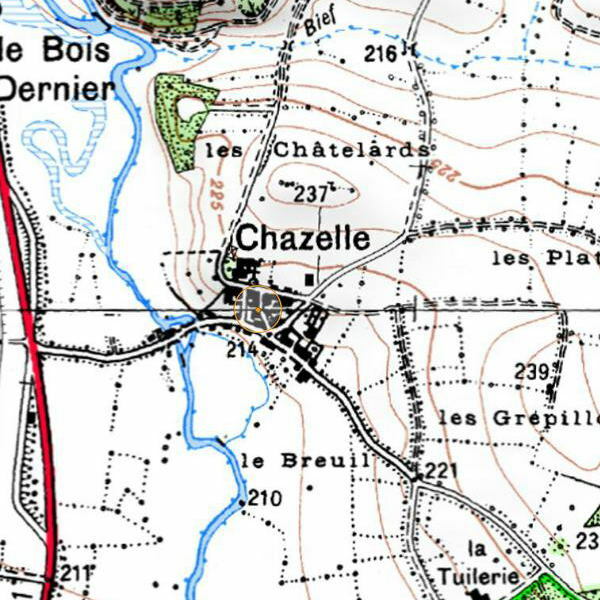 When I enter "71460 Chazelle, Cormatin" in the search window, I end up at zoom level 1. the picture shows roughly where the church can be found in relation to the main roads. Zooming in further, I end up on the ordinary IGN walking map. 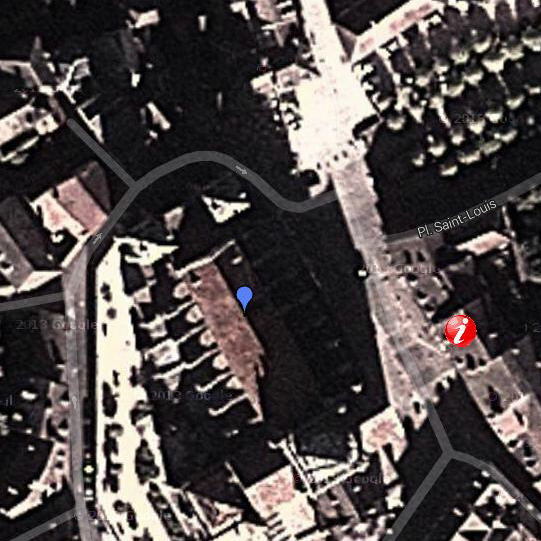 This zoom level 2 shows more accurately where the church is, although at this scale one can only pinpoint the church quickly when one knows from zoom level 1 where to look. Zooming in even further to level 3 shows the church very clearly, when one knows that grave yards are coloured violet, and churches are coloured purple. 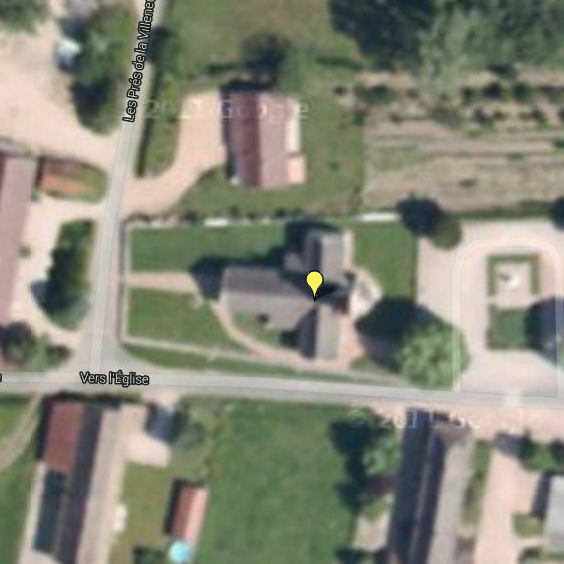 Once this far, Chazelle church can easily be traced on the satellite picture as well. Most of the above I have found out by trial and error. Certainly when I started off with these maps like the one of Saône-et-Loire I had to ask Eduard van Boxtel, the webmaster of "Le site sur l'Art Roman in Bourgogne" many a question concerning the location of certain churches. But, at the end of the day both of us can say that together we have cracked the system! 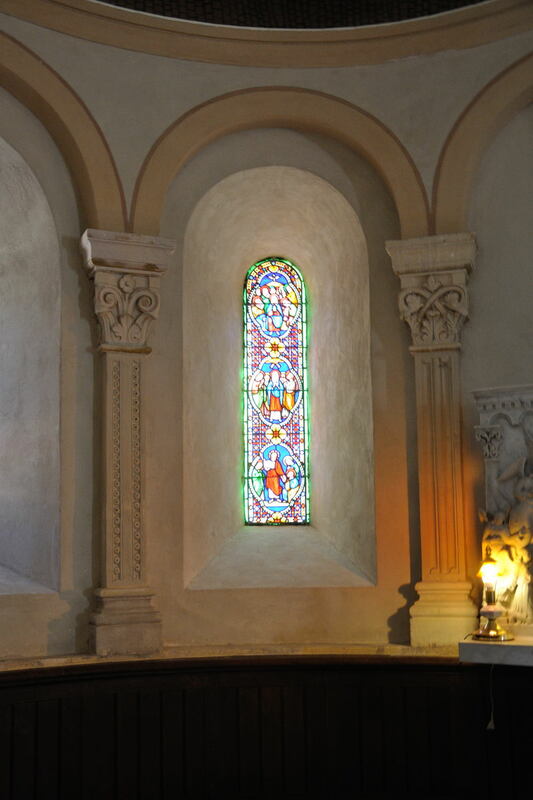 Chazelle church can also be found easily by asking for it at the owners of La Tuilerie de Chazelle. The last time we were in the Beaujolais was not just to visit some Romanesque churches; we were also on a pilgrimage to Clochemerle. And because the ability of a human being to absorb Romanesque churches is indeed limited, we decided to leave the remaining churches worth a visit in the area for what they were, and simply return some other time. So on a fine day we packed the car and drove again to the Beaujolais area. The first port of call was Beaujeu, the "capital" of the Beaujolais. 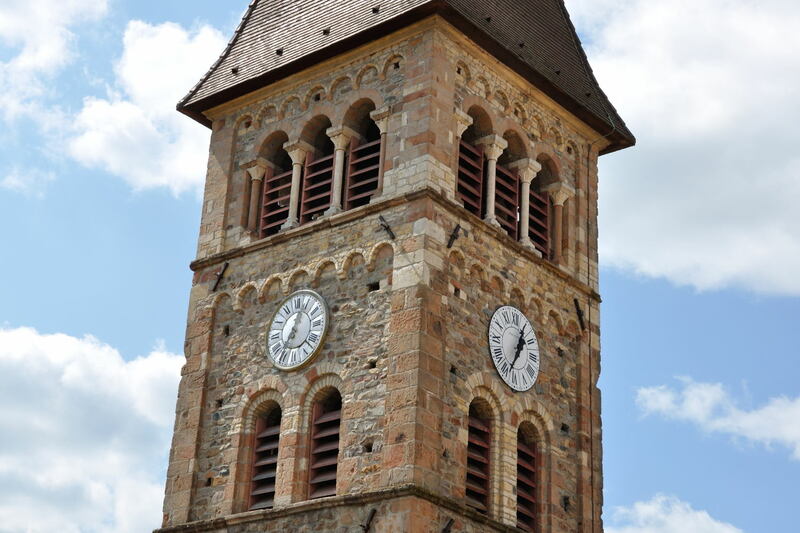 The travel guide indicated that the bell tower of the Saint-Nicoals in Beaujeu (1130) was something special, and that certainly turned out to be true. From Beaujeu we continued our quest to the north, with Avenas as the first stop after Beaujeu. 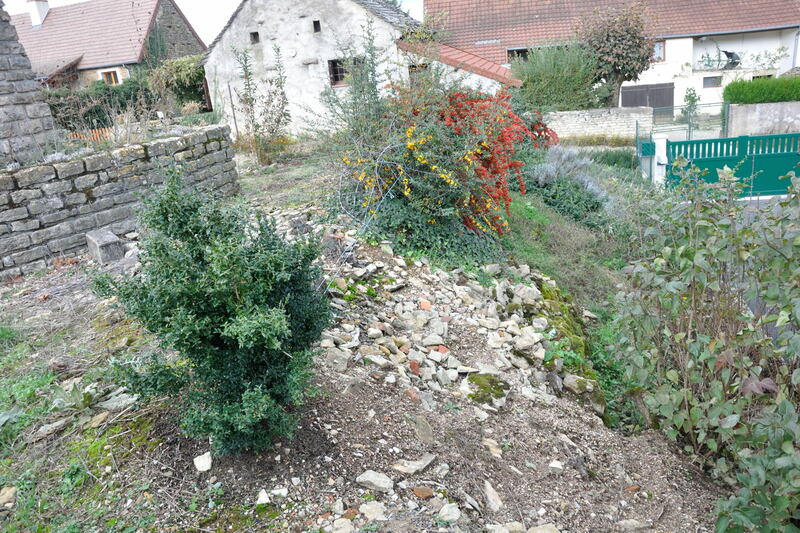 The old roman road connecting Autun with Lyon runs throug this picturesque village, which has a 12th century church, the Notre-Dame-de-l'Assomption. The church itself is interesting, but what makes it really worth the detour is the white limestone altar. The front shows Christ, seated in a mandorla with on the four corners the tetramorph. 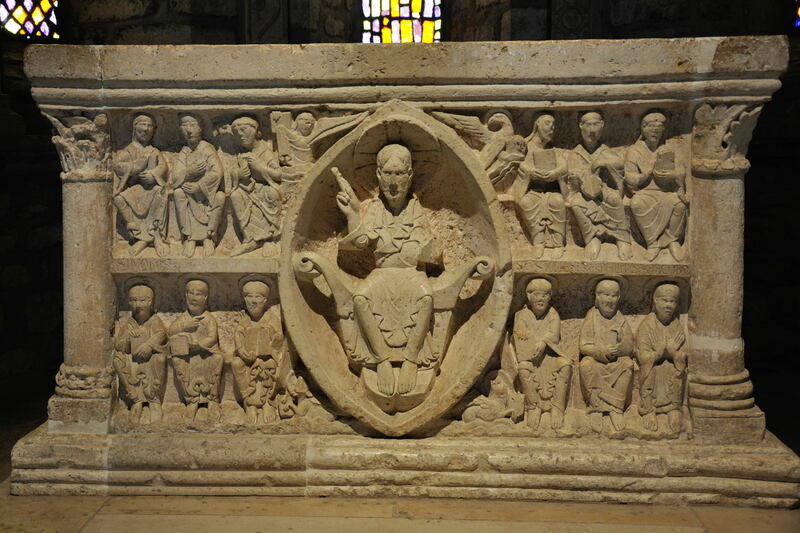 On each side of the mandorla 6 apostles are shown seated. The sides of the altar show scenes from the life of Mary (left hand side) and a depiction of the donor (right hand side), possibly King Louis VII, although the inscription at the bottom does not mention him. The last two churches, those of Ouroux and Saint-Mamert are not even mentioned in my Michelin guide, hence I cannot say much more about them than that these are nice churches. 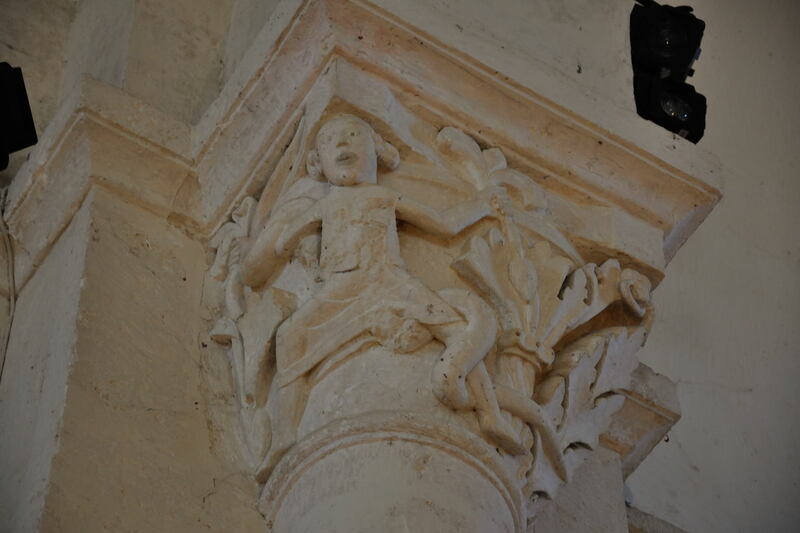 The Saint-Antoine in Ouroux has some interesting arcatures in the apse. The original nave seems to have been replaced by a new one. The Saint-Jean-Baptiste in Saint-Mamert preserves, with the exception of the nave, its original state. The old nave was wider, which is obvious when one considers one of the bricked-up passages berrichons. I found a brochure in the church about its history, hence the accurate information about the date of construction. An overview of a number of churches in the Beaujolais is given on this map. And again we managed to do it, during this second trip through the area: driving through lush vineyards, and returning home without having drunk even one sip of Beaujolais wine! The Beaujolais is outside France well known for its wines, in particular for its Beaujolais Nouveau which is promoted abroad each year with vigour. Beaujolais is also well known in France, however, I think that many Frenchmen will associate the Beaujolais area first with the book Clochemerle, and only in second instance with the wine region. 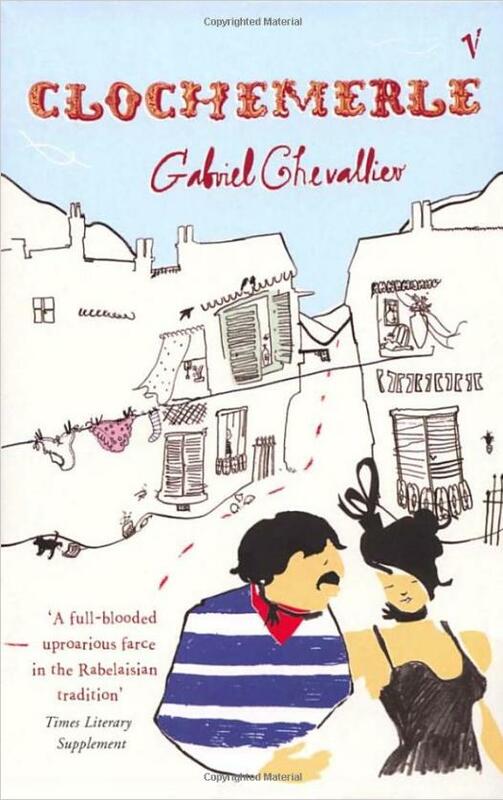 Clochemerle is the title of a book by Gabriel Chevallier set in the fictive village of the same name in the Beaujolais. But is it really fictive? 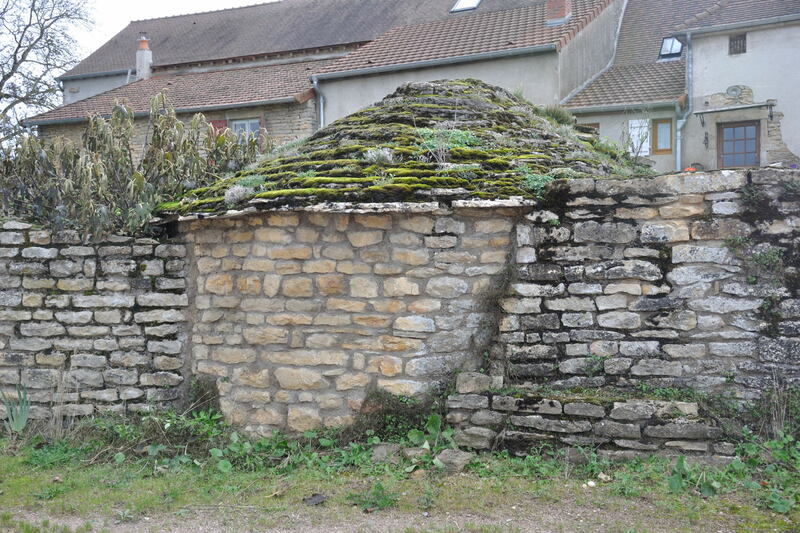 Rumour has it that Chevallier had modelled Clochemerle after the real village Vaux-en-Beaujolais. He not only used the lay-out of the village, but he also used the characters of some of the villagers. Another rumour had it that in some cases he did not even bother to change the names of the villagers! 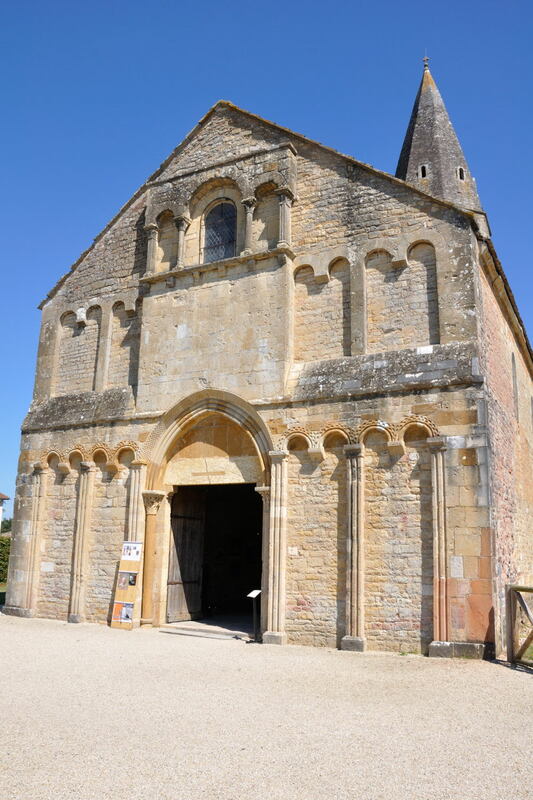 Since I have read the book (with pleasure) at least 3 times, in English, Dutch and French, it seemed like a good idea to combine a visit to some Romanesque churches in the area with a pilgrimage to Vaux-en-Beaujolais. On entering the village it becomes very clear that the rumours are not really rumours. This impression was reinforced when we saw the village square. 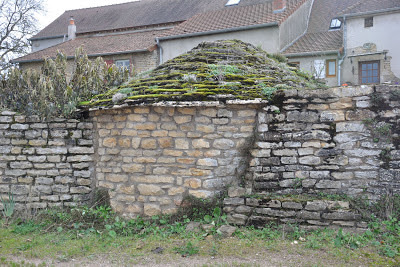 In the middle of it a public urinal had been erected as an homage to Chevallier, similar to the one that played a main role in the book and the building of which split the village into two camps. 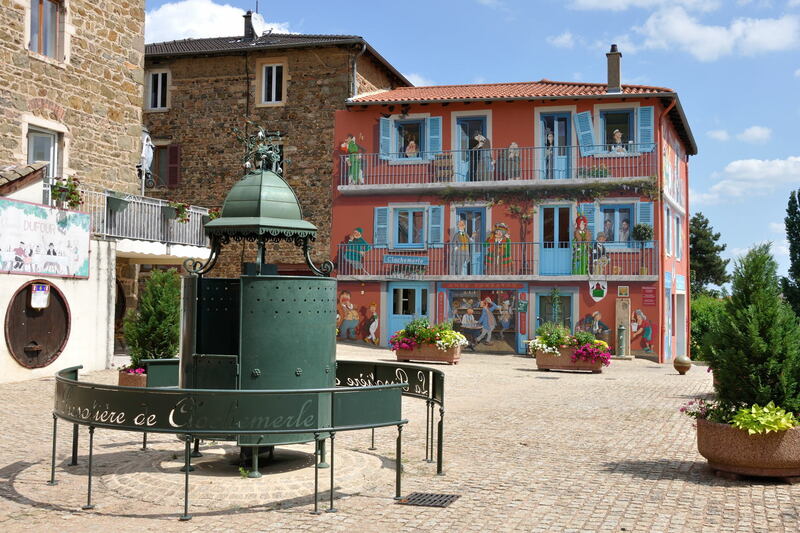 Overlooking the square stands a building on which a trompe l'oeil has been painted showing scenes from the book. 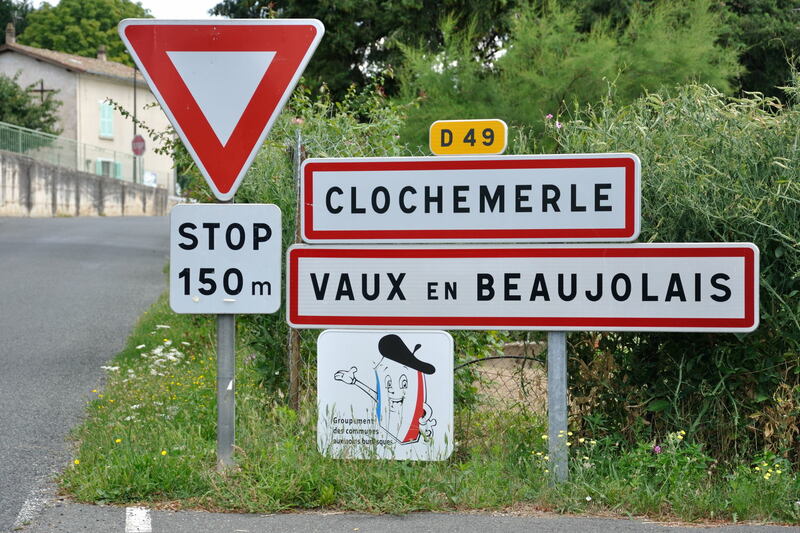 In a word, Vaux-en-Beaujolais ís Clochemerle, and obviously the village does not mind to use the similarity between the two villages to attract some tourists. 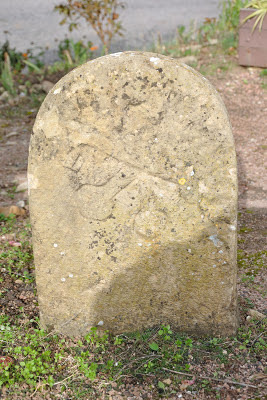 Although this blog is more about reality and fiction than about Romanesque architecture (which should be the subject of the blogs), even in Vaux-en-Beaujolais one can find traces of the Romanesque period. 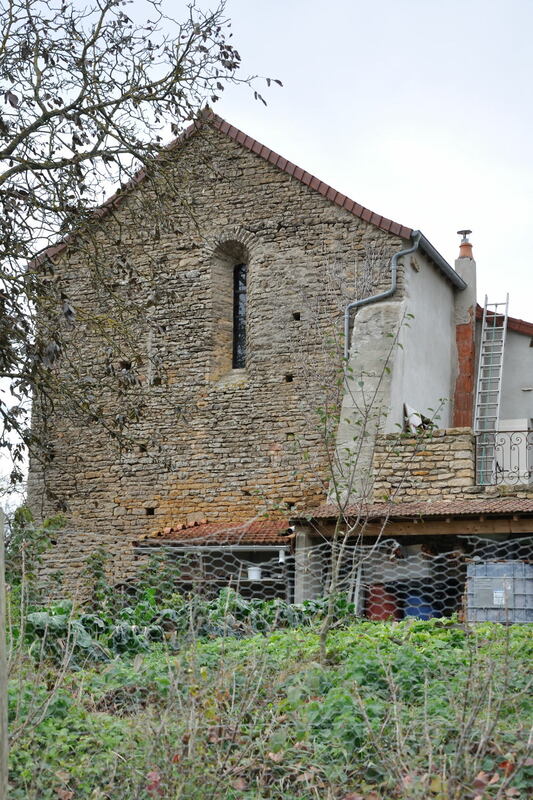 The local church has a fine bell tower, an interesting portal that gives the impression to have been re-employed when the facade was renewed and two (not very common in this area) passages berrichons. During our round trip we also visited Saint-Etienne-la-Varenne, Saint-Georges-de-Reneins, Salles-Arbuissonnas-en-Beaujolais and Belleville. Certainly the last village boasts a beautiful church, not in the least because of the stunning sculpted columns. 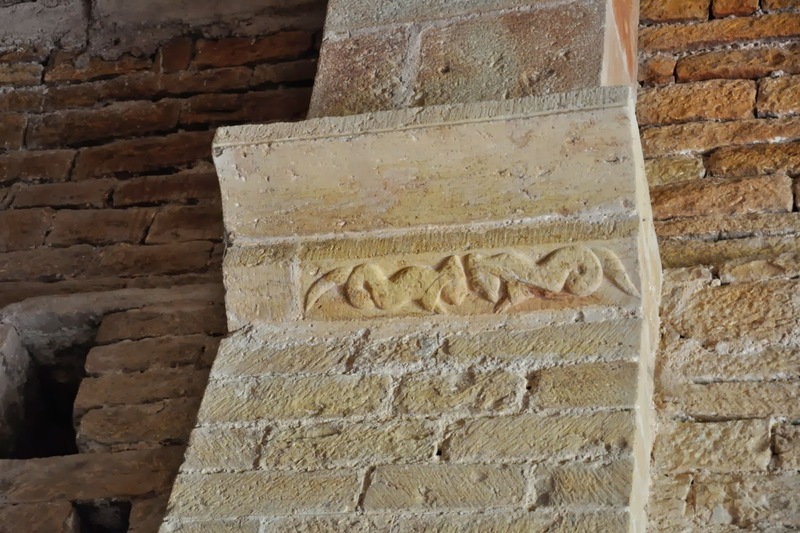 The semicircular engaged columns adorning the nave appeared to have, halfway between the column base and the capital, strange reliefs, showing human or animal figures. The apse also has some beautifully carved pilasters. 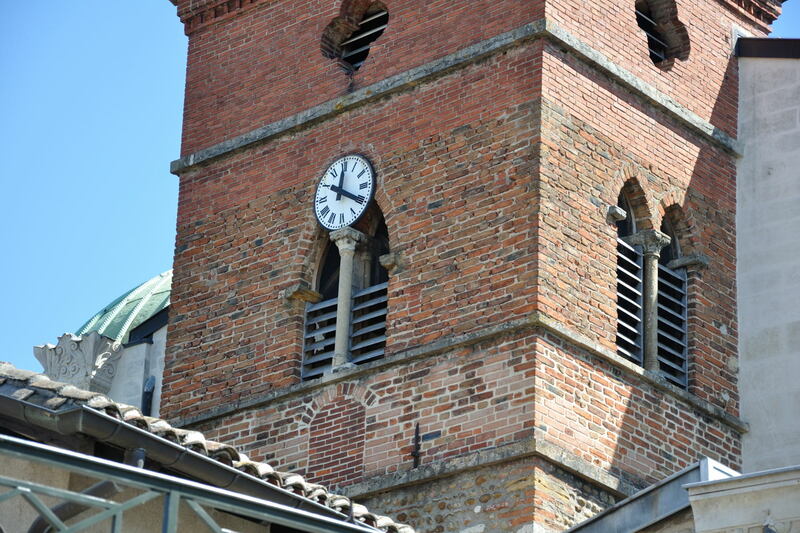 For a detailed map showing some of the churches in the Beaujolais, click here. Even though we did not drink one sip of local wine during our trip, this particular visit appeared to leave an excellent impression of the area. The Beaujolais lies at less than an hour's drive from La Tuilerie de Chazelle. This spring the population of Cluny and other people interested were given the opportunity to have a look at the most recent discoveries in Cluny's former abbey church. A huge team of archaeologists works there, day in day out, year in, year out, discovering more and more of the remains of Cluny III, this immense building demolished around the year 1800. Although not part of this year's tour, trying to fit together the tiny bits and pieces left over from the "Grand Portail" was one of the chores of previous years. This portail was one of the highlights of Romanesque architecture and sculpture, until an explosion blew the portail to smithereens in 1810. 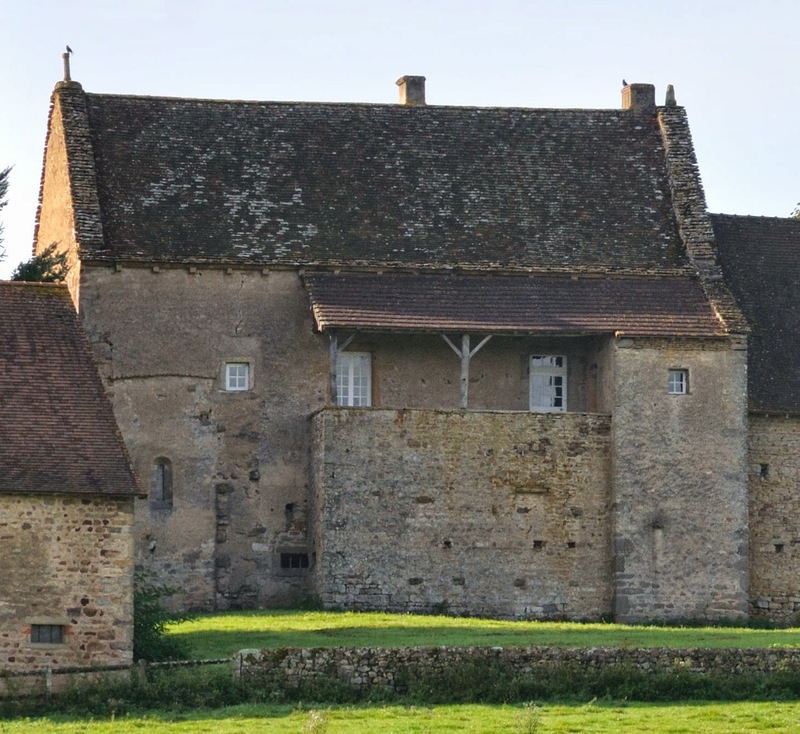 Whatever has been saved and could be located can now be admired in the Musée Ochier in Cluny. 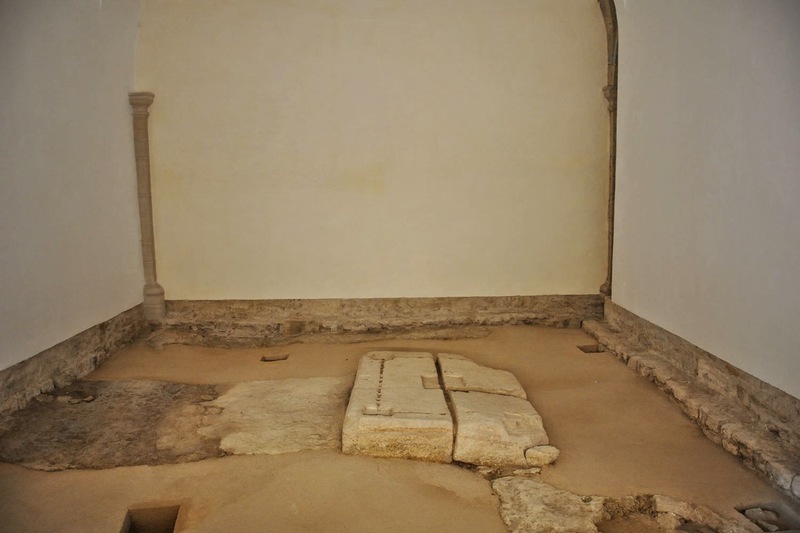 This year's tour emphasized heavily on the discovery and restoration of the lavabo (a covered area with hand wash basins in use by the monks - they utilized them before a service), and of the pedestal of the altar of Cluny II, the predecessor of its much bigger sister Cluny III. 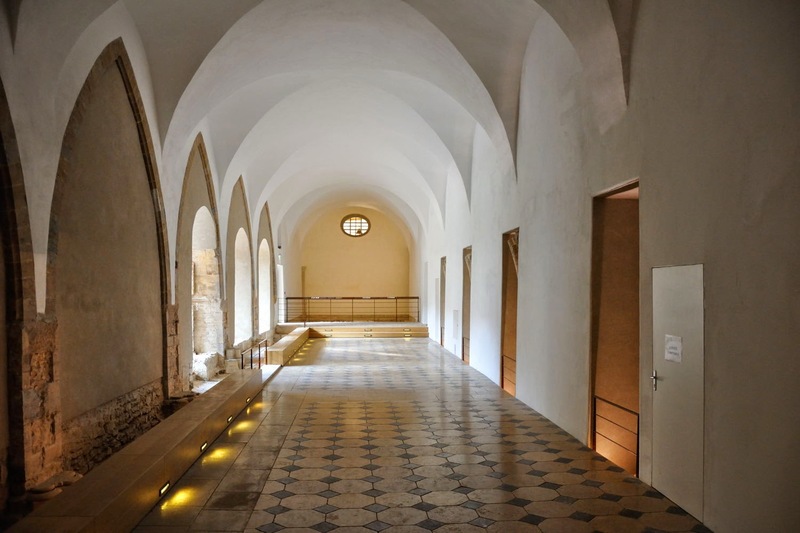 The picture shows a corridor, known as the "petit cloître". This is the former 18th century chapter house, at the side of which a number of columns of the medieval chapter house were found (the recesses on the right hand side). Behind the low gate lies the sanctuary of Cluny II. This sanctuary once possessed some relics of the apostles Peter and Paul, of whom the church carried the names. 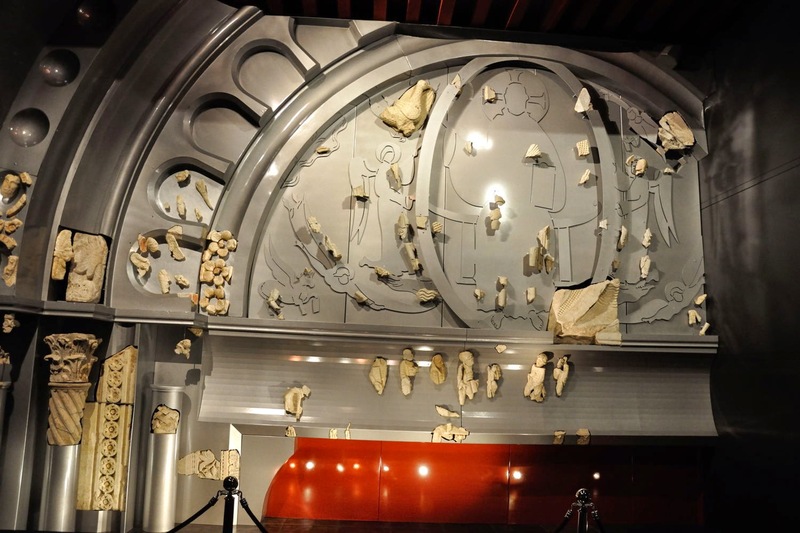 The remains of these apostles, who play a major role in the perception of the Roman-Catholics, is the reason why Cluny became a very important place of pilgrimage.